The celebration of May Day (May 1st) is, for many people, their favorite time of year. It is the time to welcome Spring, and celebrate new beginnings. The tradition of May Day Baskets is a fun way to let your friends and loved ones know they are thought of. My favorite part, is the mystery! 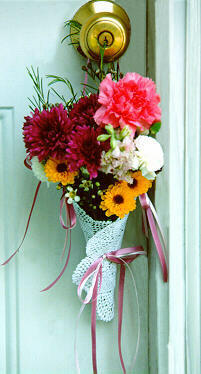 Once the special basket is crafted, it is left on a friend's front door knob. The door bell is rung, and you run and hide so they won't know who has left the greeting. It's the "random act of kindness" holiday! Just about anything can be used for the basket, even a basket! I like to use cloth doilies, that can be re-used by the recipient. This is the perfect time of year to find great bargains on cloth doilies. I have seen them at craft and fabric stores, and was lucky enough to pick up several (some Battenburg Lace) for just 99 cents! This method is my favorite. It is simple and practical since once the ribbons are untied, and flowers removed, the doily is perfect, and ready for use elsewhere. It is also an inexpensive craft, so you can make one for everyone you care about! Press the doily. Apply spray starch per container directions. Repeat starching on both sides of the doily until well starched, with a lot of body. Wrap doily into a cone shape. A straight pin will hold it fine until you tie your ribbons. Remember to remove the straight pin! Tie ribbons at center to hold the cone shape. I had a doily with a lot of crochet around the edges. I was able to tie just in the front to secure the shape. You may also wrap ribbon around the cone, and tie. With an 18" piece of ribbon, tie on a hanger. Look down into the cone. The placement of the hanger knots should be at 4 and 8 o'clock, or, toward the "front". Remember to keep your knots simple, and easy to remove. At each side of the hanger, tie bows, letting ribbon tails hang down. Fill with bright spring blooms and grasses. For an optional "vase" effect, you can cut a piece of Aleene's Shrink-it or Crafting Plastic into a circle, 1" smaller than your doily. Cut away approximately 1/3 of the circle, and form a cone that will fit down into your doily "basket". Staple or tape to hold the shape. Line the cone with clear kitchen wrap. You may then place a small amount of water in the basket to help your blooms stay fresh. This is nice when the recipent is not at home. This is such an easy craft! Get the whole family involved! My motto is: "The family that crafts together, laughs together!"